Enchantingly located on the lush green Peacock Island in the middle of the Brahmaputra, about 1km north of railway station, the Umananda Temple provides for spectacular views of the river. Since the temple is at the center of River Brahmaputra, it can be accessed only on ferries or motor launches. 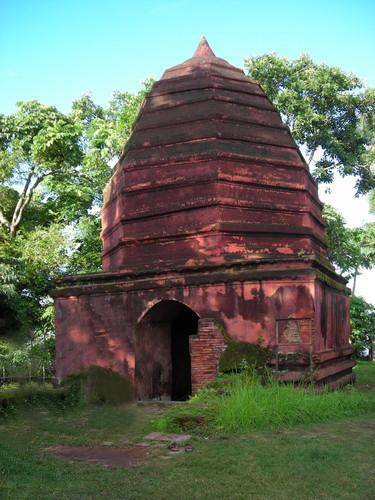 The temple is dedicated to Lord Shiva, and the temple was built by famous Ahom king Gadadhar, who was famous for his allegiance towards Shiva. The walls of the temple are wonderfully engraved and sculpted, which stand proof of the artisanship of the people of the past. Representations of Lord Surya, Ganesha, and Shiva in addition to those of Vishnu and his ten incarnations can be vividly seen here. The main shrine is reached by a flight of stairs which are quite steep and take a good amount of energy to reach. The slow breeze which flows the whole time you are travelling to this place is also very supportive of the pleasant experience the place provides. This place is out of the ordinary and is a must visit place in Guwahati. Not every day do you see an entire temple in a small island in middle of the river; it is indeed a feast for any visitor.